What size / type of SCUBA tanks do you use? We use steel tanks due to better buoyancy properties. We use 10 liters, 12 liter and 15 liter bottles. We use steel tanks due to better buoyancy properties; 10 liters, 12 liter and 15 liter bottles. Please let us know in advance which tank configuration you require for the equipment you bring, so we can have it ready for you. What is the best time of year to dive Madeira? Diving in Madeira is all year round due to excellent weather conditions. The very best time is between March and December when weather conditions are more stable. Can we hire selected items of dive kit? How far is the walk from your premises to the house reef? The House Reef is 50mt from the shop. Don’t worry anyway, the only things we ask you to carry are mask and fins! How far do I have to walk with the dive gear? You’ll always find your equipment ready to go diving, either at the house reef or at the boat. How far you have to to walk with it? Just the necessary step to get in the water! ? 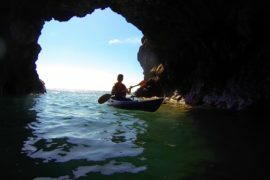 Do you rent out GoPro? Yes. 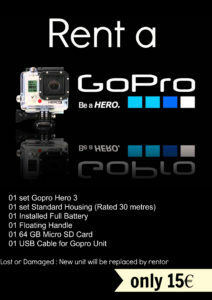 You can rent a GoPro Hero 3 at 15€. The photos will be uploaded as high resolution images on dropbox or copied to a memory stick.